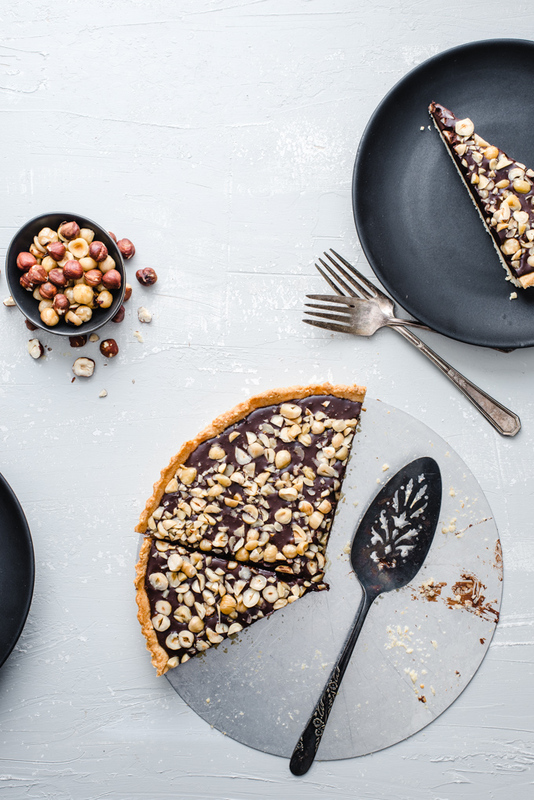 Our love was impulsive, this hazelnut tart, and I. We sort of fell into it swiftly. I’m pretty sure I searched for dinner recipes, and this little sneak fell on the same page last week. This, my friends, is clearly not a dinner recipe. It’s more of a “delightful add on to an already debilitating dinner coma” type thing. What I did, you see, was take the night off work so I could compile ingredients and dedicate my day to blanching, peeling, and toasting hazelnuts. In addition, I’ve been dying to make some heavenly meat pies from Lady and Pups, so I went about doing that too. It made for good timing, alternating between recipes and pulling together a delicious, and ridiculous dinner. It’s funny that I decided to make a chocolate tart because I usually have little interest in chocolate. Whatever the reason, yesterday I busied myself making this. Honestly, my favourite part had to be when the tart crust was browning in the oven. The smell of roasted hazelnuts filled the kitchen – heaven. While I made the filling I kept getting distracted, because Bob had come up alongside me and began tucking filling into meat pies. Split attention span. Thankfully, my tart was easy to finish up, and I could partake in the fun folding Bob was getting into. Soon, I busied myself making meat pies, eating them, and savouring our semi-sweet dessert afterwards. 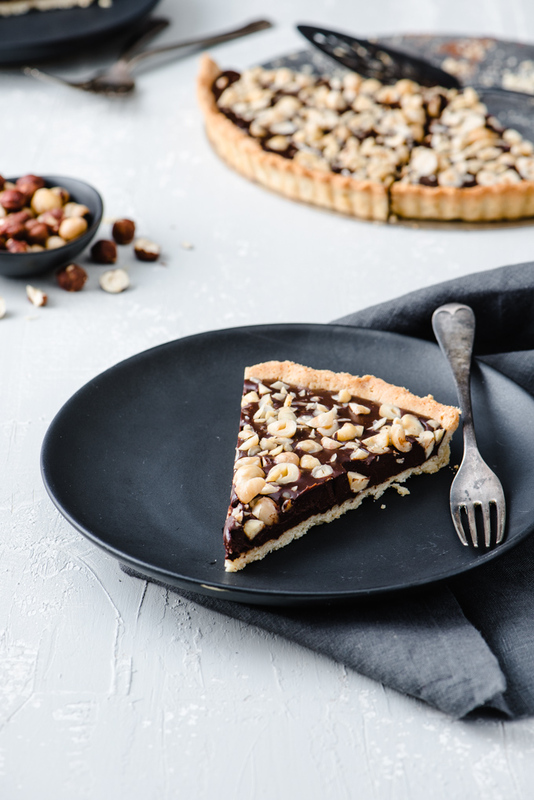 A rich chocolate ganache filling, topped with toasted hazelnuts, on a delicious hazelnut crust. Spread hazelnuts on baking sheet, toasting about 10-12 minutes until golden, and skins are blistered. Let cool, then place hazelnuts in an old kitchen towel, and rub off skins. Combine hazelnuts, and 1 tablespoon of sugar in a food processor, and process until fine. Add processed hazelnuts, flour, salt, and 3 tablespoons of sugar into the bowl of your stand mixer. Mix with the paddle attachment, until combined. Add butter, mixing at low speed until incorporated. Add egg and vanilla, mixing until a soft dough forms. Scrape dough onto a sheet of plastic wrap, and flatten into a disk. Spray a 9-inch fluted tart pan (with removable bottom), with non-stick cooking spray. Roll out cooled dough between 2 sheets of parchment paper, into a 12-inch round disk. Place the dough in the tart pan, pressing to the edges. Using a rolling pin, roll over the tart pan to remove excess dough. Refrigerate tart shell for 10 minutes. After 10 minutes, remove the tart shell, and line with pachment paper, and fill with pie weights or dried beans. Remove parchment and pie weights/beans, continuing to bake another 15 minutes, until golden brown. In a small saucepan, add cream, and bring to a simmer. Pour heated cream over your chocolate, and let sit for 5 minutes, then whisk until smooth. 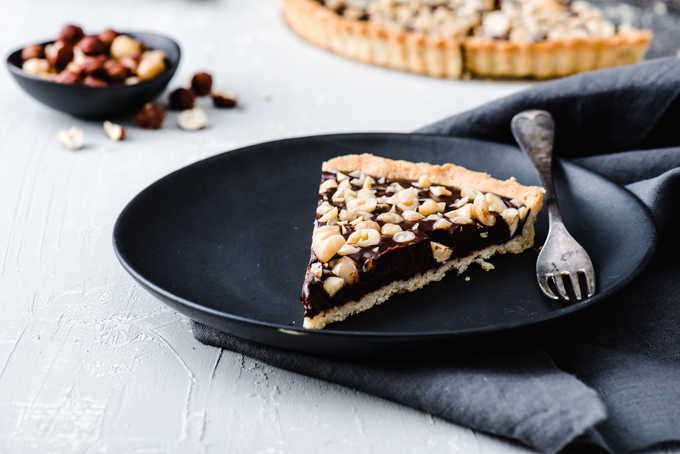 Pour chocolate & cream mixture into the tart shell, top with chopped hazelnuts, and refrigerate until firm, about an hour and a half.